Stage director and producer, he is the general manager of T&M-Paris since 1997, after working as assistant manager of Atem with Georges Aperghis (1992-1997). He has commissioned new operas and music theater pieces (Aperghis, Bianchi, Dillon, Donatoni, Dusapin, Filidei, Goebbels, Pesson, Rivas, Sarhan…) and made possible french premieres (Dusapin, Goebbels, Mitterer, Sciarrino…). Recently, he has staged La traición oral by Mauricio Kagel (2018, CETC - Teatro Colón Buenos Aires), 200 Motels by Frank Zappa (2018, Musica-Zénith de Strasbourg, Philharmonie de Paris), La Passion selon Sade by Sylvano Bussotti (2017, Théâtre de Nîmes), the creation of operas by composers Betsy Jolas (Iliade l’amour, 2016, CNSMDP / Philharmonie de Paris) Francesco Filidei (Giordano Bruno, 2015, Casa da Música Oporto) and Sebastian Rivas (Aliados, 2013, Théâtre de Gennevilliers) as well as Ring Saga (The Ring by Richard Wagner, in Jonathan Dove-Graham Vick version), a 3 days long production premiered at Casa da Música in Oporto and touring later in France, Luxembourg and Italy. He has also staged Wanderer, post-scriptum a recital with the barytone Ivan Ludlow (2013), Pas Si (Stefano Gervasoni, 2008), Kafka-Fragmente (György Kurtág, 2007), The Rake’s Progress (Igor Stravinski, 2007, 2009), Consequenza, A Tribute To Luciano Berio (2006), Medea (Pascal Dusapin, 2005) and Richter, A Chamber Documentary Opera (Mario Lorenzo, 2003), productions which have been performed in France, Europe and Argentinia. In February 2019, he is going to stage Voix in situ in the frame of the event L'Envers du décor at Palais de la Porte Dorée in Paris. 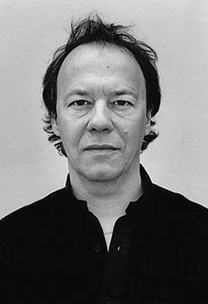 ​He has written numerous articles on contemporary music and has edited a collective work on Georges Aperghis (Le corps musical, Editions Actes Sud, 1990). In 2009, he has leaded the "Atelier Opéra en Création" of the Festival d’Aix-en-Provence, in 2012 he is guest professor with composer Giorgio Battistelli at the Accademia Chigiana in Siena, in 2017 he is a tutor of Biennale College program at the Venice Biennale, and in 2018, he is guest professor at Winter School in Buenos Aires.